Contact Bettencourt Tax Advisors’ experienced team today! We can find the right property tax solutions for you! Bettencourt Tax Advisors, LLC headquarters is located at 730 N. Post Oak Road at the corner of I-10 and 610 Loop West in Houston. We are conveniently located to serve you in Harris County and the surrounding counties of Montgomery, Fort Bend, Galveston, Brazoria, Waller, Liberty, and many others. 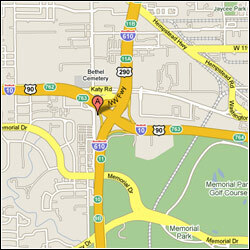 Click here for directions to our location!